Five Years ago, I learned about Floorball from Hockey Legend Borje Salming. At that time, I picked up a Floorball stick and felt the future of Hockey in my hands. When introducing Floorball, as I have done so many times to new people, a common first reaction is to dismiss aspects of the game of Floorball; The Stick is too short, The Ball is too light, The goalies have no stick?, But where is the ice? I would say a typical Canadian reaction to learning about Floorball is to pick it apart. Maybe that’s why we are the best Hockey Nation in the World, I don’t know, we are sensitive about our brands of hockey, and so we should be. And then, we take a shot…and it rips top shelf with a flick of the wrist. Then we stickhandle and feel, and tap, bounce and twirl, adjust, and shoot, and attempt to corral the ball, at first mostly getting air. For Canadians, this is not the Floor Hockey stick of the past, the one we all grew up with, it’s something new, fresh, cool, hip, ergonomic, familiar yet distant – It’s a Floorball stick, a “euro thing” that permeates through the hockey communities of Sweden, Finland, Switzerland, The Czech Republic and beyond. …there is something about a Floorball stick, a certain magic to it. Canada does have a national federation that belongs to the International Floorball Federation, it’s called Floorball Canada. There are Provincial organizations, leagues, Hockey Academies, Hockey Schools, Elementary Schools, Secondary Schools, Indepedent Schools, Universities, Private Clubs, Corporate sport groups. There is a National Championships, and a few big tournaments that take place every year. Canada is becoming a Floorball nation, and it’s happening, virtually under the radar, with no funding, no corporate support, and very little media recognition. We need to talk about this, we must discuss why Floorball is succeeding wherever it goes, and why our Hockey Canada Skills Academy talent, AAA girls and boys, across the country, are honing their skills in school gyms and local rec centers with Floorball, and yet few hockey journalists have ever even heard about the sport- they just assume we are talking “Floor Hockey” with those lousy plastic sticks. 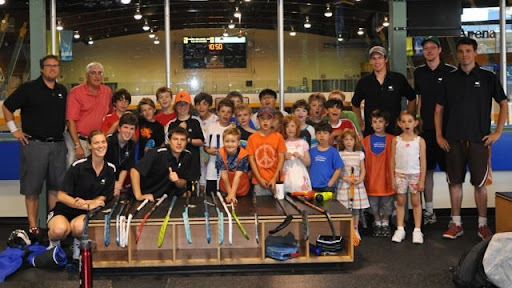 Recently, I conducted two week long Floorball Summer Skills Camps where parents would approach me afterwards and say that they preferred Floorball to Hockey citing violence, the cost, and the early morning practices. Furthermore, the smiles, the sweat, the drills, the games, the growth that their kids displayed just validated to them that there could be an alternative to Hockey, that is technically Hockey without the skates and the smelly bags. Many Parents feel mixed emotions about floorball because they played Hockey growing up and it shaped them as people like nothing else could, and although they want their own kids to learn about Team, Hard work, Dedication to Sport, Canadian culture and all of the wonderful things that Hockey brought them, they see so much madness connected to the game now. They crave the simpler times of Hockey, where it just happened without all of the big expense and the big fuss…and enter Floorball. Floorball is going to provide tens of thousands of Canadians an opportunity to “feel” Hockey and the sensations of scoring a big time goal and making a poetic pass. No matter how much doubt and scrutiny you throw at the stick and the sport of Floorball, as it relates to Hockey, it counters back with an explanation, a smart take, a scientific observation, and a model of proof from blossoming Hockey communities/cities like Gothenburg, Prague, Helsinki or Zurich. For here is a version of indoor hockey that requires minimal equipment- a stick and a ball. It is played as a team game, it is very high tempo, high scoring, high energy, physical but safe, it’s easy to learn yet develops amazing skills. Floorball should be in every school in Canada. Floorball is currently being utilized as an off-ice training system for Hockey Canada Skills Academies, coast to coast. Do your homework people, You will see! Floorball has arrived in Canada but needs a helping hand, as Floorball is a Sport for Everyone. I remember reading the summary from the last Hockey Summit in 1999, and am happy to see the 11 recommendations come forward in a real way to develop Hockey players and enrich the Hockey experience. I have personally witnessed thousands of smiles of bewilderment, as Young Canadians, New Canadians, Old Canadians, Disabled Canadians, pick up a Floorball stick for the first time. At first play, the ball is bouncing everywhere and you can see the power shift from the hockey players to the newbies. from the hack and whackers to the runners and the thinkers….it’s a mind shift that provides agility and skill to the Hockey player that already has the strength and force, and it’s empowering to an athlete who has never skated, and now can “snipe” one from 30ft at 90km+/hr. Floorball is an exhilarating game. It speaks to everyone. It enhances skills in a Young Hockey player and it brings skilled players into Hockey. Canada has the infrastructure, the will and the desire to breed Hockey talent like no other nation. You will see Floorball as a solution at every school, rec center, sport club, minor hockey program, skills development center, high-performance academy, Olympic training program, and corporate fitness programs. Floorball is an important component of the Hockey Player Development matrix. It is also a potential gateway sport to assist many Hockey enthusiasts who are a bit hesitant to enter the world of Hockey participation. I have had many discussions with families that are using Floorball to hedge their bets that their children will one day wish to play Ice-Hockey. So, by developing Hockey Smarts and Skills through Floorball, a young player can join-in on Ice Hockey years down the road, if the interest and/or passion is brimming. Greg Beaudin is the founder of Modern Hockey, a forward thinking Hockey company with deep roots in Ice Hockey and Floorball. Modern Hockey has worked with dozens of Hockey Canada Skills Academies to develop their Floorball cross-training programs. Greg is the son of the “Original Jet” Norm Beaudin, and grew up in a household where Finnish, Swedish and Swiss Hockey was always highly respected. Like the Oilers of the ‘eighties, Greg’s hockey philosophies were also shaped by the formidable International elements of the Winnipeg Jets of the seventies. It is this base knowledge that brings Modern Hockey to Floorball and why the push is on to grow Floorball in Canada. stop by ModernHockey.com to learn more about Floorball and learn how to easily bring it to schools.